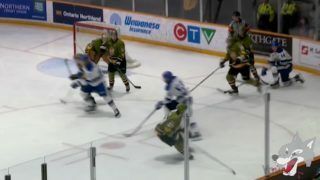 The Sudbury Wolves closed out 2018 with a 5-4-0-0 record in the month of December. With the OHL trade deadline now passed, the playoff race is heating up in the Central Division and the Eastern Conference. The Wolves will need to be sharp down the stretch and continue their hot start to 2019 as they currently are riding a three-game winning streak. For a second straight month, the recipient of the TESC Hardest Working Forward of the Month is David Levin. The Tel Aviv, Israel product scored four times and assisted on eight others to finish December with twelve points in eight games. David continues to consistently produce for the club and will look to continue to push himself from a scoring perspective, on pace for his best season yet in the OHL. The Sudbury Wolves would like to congratulate David on his hard work, determination, and leadership that he has brought to the rink every day throughout the season and hope that he continues to have the same drive for success going forward. Liam Ross is the TESC Hardest Working Defenceman of the Month for December. The 17-year old defenceman has been an excellent part to the team’s success this season from a defensive perspective and really stepped up his game offensively in December. His seven assists gave him seven points in nine games for the month of December and he has almost doubled his point total for his sophomore season during the month. Liam is an integral part to the club’s blue line as he brings his best every night and is just scratching the surface of his game. 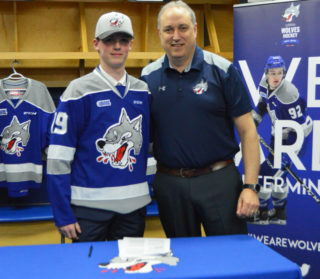 The Sudbury Wolves are excited to watch him to continue to grow and develop with the club as the season progresses and are confident that the best is yet to come from the young pivot. The Sudbury Wolves would like to congratulate Liam on an outstanding month and hope he continues to find success on both sides of the puck as we begin the new year. The Reg Wilkinson Men’s Wear Scholastic Player of the Month for December is first-year defenceman Jack Thompson. The 17-year-old Courtice, ON native is currently attending St. Charles College where he is taking University English, Leadership, Functions and Applications, and Physical Education. Jack is excelling in his courses as he currently holds an average of 84% between his four courses. The Sudbury Wolves would like to congratulate Jack on his strong performance on the ice and in the classroom. Quinton Byfield won December’s Molson Canadian 3-Star Player of the Month Award. 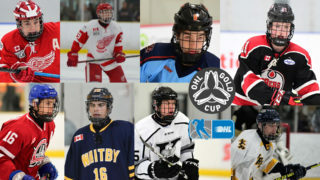 Throughout the month of December, the Newmarket, ON native notched 13 points over 9 games including 6 goals. 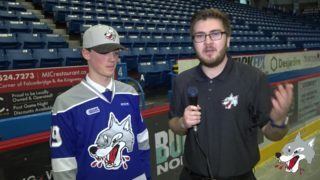 The Wolves forward was named second star in a 7-0 win over the Mississauga Steelheads on December 2nd where he scored once and assisted on two other goals for a three-point night. Byfield followed that up with another second star performance in a Wolves 5-1 win over the Barrie Colts where he picked up one goal and one assist. On December 13h and 14th Byfield was outstanding as he was named first star in both contests. On the 13th he registered two goals and two assists for a total of four points in a 6-3 win over the Barrie Colts and followed it up with a two-goal performance on Teddy Bear Toss Night, in a 5-2 win over the Kitchener Rangers. 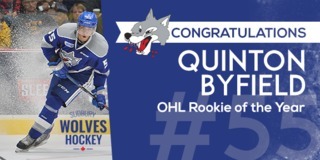 The Sudbury Wolves would like to recognize and congratulate Quinton on his excellent play during the month of December. Wolves goaltender Ukko-Pekka Luukkonen has been named December player of the month. The golden goalie had an outstanding month in December and recently won Gold with Team Finland at the 2019 IIHF World Junior Championships. Luukkonen was also named the OHL Goalie of the Month for December and CHL Goaltender of the week for the week ending December 2nd. The Espoo, Finland native currently sits 1st in the OHL in Goals Against Average with 2.42 and second in save percentage with 0.923. Since his return from the World Junior, Luukkonen has 2 wins, including a shut-out on Friday night. The Sudbury Wolves would like to acknowledge Ukko-Pekka Luukkonen for his outstanding performance this past month and are excited to see his stand-out performance continue. Ukko-Pekka Luukkonen has also been named the Wolves United Community Player of the Month for December. Luukkonen has been keeping busy when he is not at the rink as he makes routine visits to Finlandia Village when he can and always makes time for fans at community events or before and after games. During the month of December, he posted a perfect 5-0 record with a 1.97 goals-against average, .937 save percentage, and one shutout. The Sudbury Wolves would like to recognize Ukko-Pekka for his contributions in the Greater Sudbury community and are pleased to have him as a member of our organization. On-ice presentations will begin this Wednesday when the Wolves continue their five-game homestand to host the North Bay Battalions at 7:05pm. 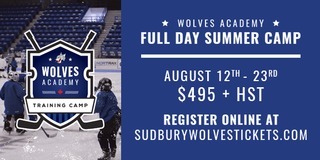 Tickets are on-sale now at sudburywolves.com.